UNCW is participating in a two-year pilot of the new Future Teachers of North Carolina program. 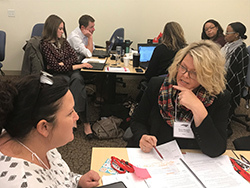 FTNC brings faculty at three universities together with 18 teachers statewide on a program designed to attract high school students to the teaching profession. The UNC System Office is overseeing the program in collaboration with the North Carolina Department of Public Instruction. Western Carolina University and North Carolina A&T State University are also partners on the pilot initiative. A key goal of FTNC is to formalize the teacher pipeline process. Participating students will take two college-level teaching courses, participate in field experiences and build a teaching portfolio. UNC’s institutions of higher education will also provide professional development for participating teachers. UNCS and NC DPI are working from the model developed by CERRA for South Carolina’s highly successful Teacher Cadet Program. The SC program includes 170 high schools serving an average of 2,700 juniors and seniors annually. 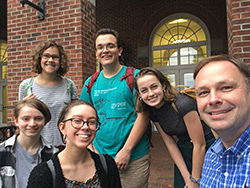 For the initial curriculum development, UNCW brought together a faculty steering committee consisting of Candace Thompson, serving as lead faculty contact, Amy Moody, Alicia Brophy, Martin Wasserberg and Symphony Oxendine. Thompson is chair of WCE’s Department of Instructional Technology, Foundations and Secondary Education; Moody, Brophy and Wasserberg are faculty members in the Department of Early Childhood, Elementary, Middle, Literacy and Special Education; and Oxendine is an assistant professor in the Department of Educational Leadership. 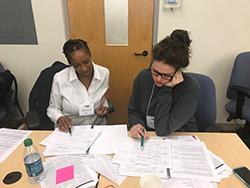 Over the summer, Thompson and Moody collaborated with faculty from Western and A&T on curriculum design and first-year plans for the pilot. They also attended a two-day work session with participating teachers. UNCW is supporting FTNC pilots at Hoke County, Rocky Mount and Clayton High Schools during the 2018-19 academic year, and hopes to double school participation during Year 2 of the pilot. The Watson College welcomed the first cohort of the Future Teachers Career Academy at Isaac Bear Early College High School in August. The FTCA is a small learning community for high school students interested in becoming a teacher. The program is the result of a collaboration between the Watson College, New Hanover County Schools and IBECHS. The FTCA provides students with opportunities to mentor, volunteer and participate in a wide range of educational experiences. Students will receive early advisor support in preparing a path through high school, priority consideration for acceptance into UNCW’s Watson College of Education and priority consideration to teach in New Hanover County Schools following graduation from WCE. Two freshmen and three seniors comprise the inaugural FTCA group. Brian Brinkley, director of WCE’s Betty Holden Stike Education Laboratory, Rebecca Griffith , Social Studies teacher at Isaac Bear, and Kristin Jackson, NHCS director of student services are partnering on design of the FTCA curriculum and career-specific enrichment experiences for students. Shirley Fowler and Tyler Gibson, WCE students and recent IBEC graduates, are serving as FTCA student mentors during the 2018-19 school year.